UDM Downloads > Word Password Unlocker Software! PDS Microsoft Word Password Unlocker software available for recovering lost or forgotten Word Doc Password. There are just few steps to unlock word documents from password protected MS Word document. Professional Word document unlocker software is produced with innovative technology based algorithm that helps to easily get word password and open protected word document. Perfect Word Password Unlocker software is a very fast doc file password recovery tool for all system administrator who can protect word doc file with a security key. 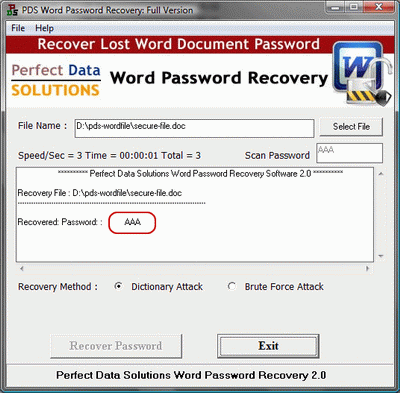 PDS Word password unlocker helps to recover password protected word document when you loss your MS Word file open password and needs to recover it again. DOC Unlocker tool uses Dictionary Attack and Brute Force Attack to recover original word document password. Best Elements of Word Password unlocker Software: * Support multilingual passwords. * Recover DOC password using Dictionary Attack and Brute Force Attack * Uncomplicated and intuitive interface. * Technical support via e-mail. * Recover all types of passwords from MS Word 6.0, 97, 2000, XP, 2003. * Software Support install or uninstall. * 24X7 online technical support. * Easy and quick user interface. MS Word Password Unlocker program is an absolute word password recovery tool which can takes very little time to read word file password and unlock word password. Perfect Data Solutions remove word password from MS Word 6.0, 97, 2000, XP, 2003. Download free Word Password unlocker software and try to recover doc password. Demo version software show's you only first 3 characters of your password. Purchase PDS Word file unlocker at $19 and recover full word document password.